Every year, Worship Leaders, Praise Teams and Musicians from around the country of all ages and different backgrounds share this retreat with excitement, joy and worship while strengthening our brotherhood, sisterhood and walk with God for 3 days of Impartation, Networking, Refreshing, and Revitalization. This year, we come alive in the river! 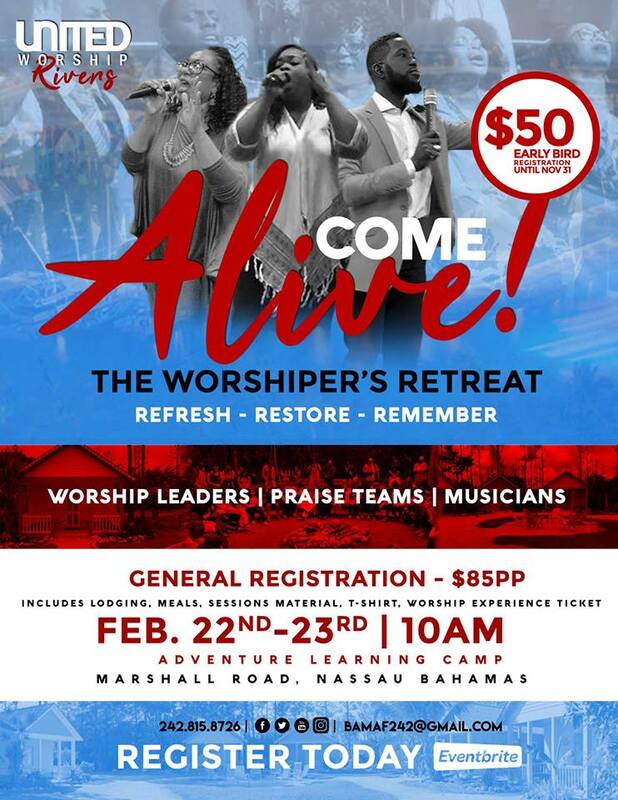 We invite you to join us for this overnight retreat, February 22 – 24 at Adventure Learning Camp, Nassau Bahamas. Registration will include Lodging for 3 nights, 6 Meals, Sessions, Materials, United Worship Experience Access. Space is limited. There are only 120 spots for this AMAZING Worship Retreat. You must be there! $50 Early Bird registration Until November 31.